Welcome to Penrheol and our 4 Star Luxury Self Catering Barn Conversions sleeping from 2 to 8 people. Former farm barns built with traditional welsh stone, stylishly decorated and combining the charm of the old with the ease of the new. Soak in the evening in your own private hot tub and enjoy the stunning panoramic views. Situated in the lovely countryside of Mid Wales, one and a half miles from Builth Wells a market town with a selection of shops and restaurants. 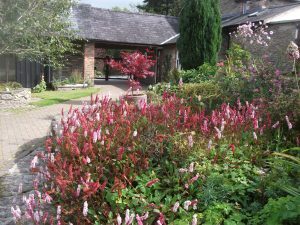 We can cater for everyone, Romantic couples, Families with Children, Groups of Friends or Extended Families, Older People Seeking Off-Peak Peace and Quiet. We welcome children of all ages who will enjoy our play area. All rooms are at ground level and have full central heating. There are plenty of parking spaces, and the various gardens and terrace are all available for your use. A coarse fishing lake half a mile away.